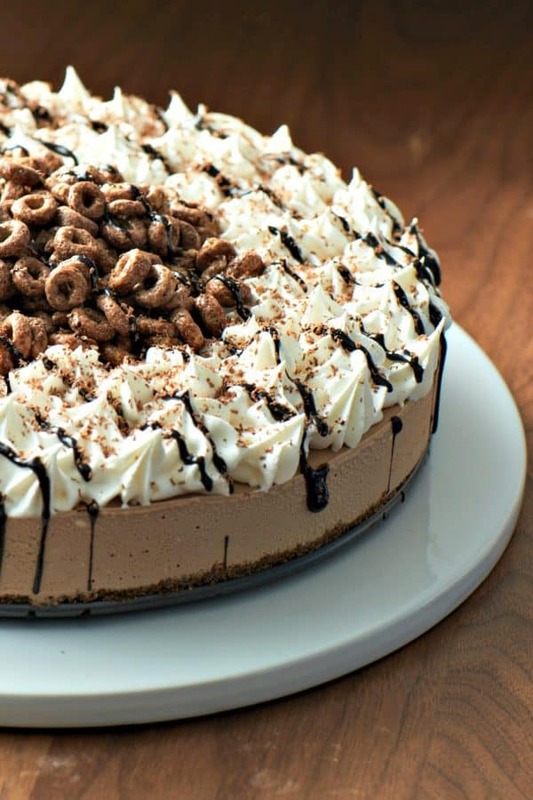 It’s National Cereal Day so it’s time to celebrate everyone’s favourite snack food and easy breakfast with 10 Minute Creamy Chocolate Icebox Pie which makes ample use of delicious Chocolate Cheerios for the crumb crust! Sometimes you need a dessert fast. You want something that looks and tastes impressive enough to make people think you slaved over it, but you just don’t have the time. This doesn’t have to mean you buy one from a bakery, friends. Enter 10 Minute Creamy Chocolate Icebox Pie; stage left. Aside from just plain looking nice, being lightning fast to make, and requiring no baking, 10 Minute Creamy Chocolate Icebox Pie has the added bonus of containing only 7 simple ingredients; Chocolate cheerios, butter, cream cheese, chocolate ice cream, whipped cream, chocolate syrup, and a little bit of grated chocolate bar. If you want to count the teaspoon of vanilla extract, we’re up to 8 ingredients. I know some folks consider pantry staples a “gimme” in ingredient counts and others don’t buy it unless you count everything down to the salt and pepper. So is it 7 or 8 ingredients here, folks? Either way, 10 Minute Creamy Chocolate Icebox Pie is a simple, delicious, and beautiful dessert. “But wait! 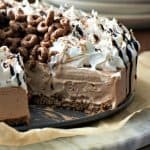 There’s more!” 10 Minute Creamy Chocolate Icebox Pie is made with gluten free Chocolate Cheerios as the base for the crust, making this a great dessert to share with your gluten sensitive friends and family. I love the Chocolate Cheerios here because while they are lightly sweetened, they don’t add a sugar bomb to an already sweet dessert. The whole grain oats they contain add a nice nutty counterpoint to the chocolate, as well. My husband likes the Chocolate Cheerios crust so much that he requested this be our standard crumb crust. I’d like to thank The Slow Roasted Italian’s Lucky Charms No Bake Icebox Pie for the inspiration to do this! As if all of that wasn’t enough, this gorgeous icebox pie holds like a dream in the freezer, just waiting for you to break it out when you need or want it. I made one for our freezer, decorated it before serving it, and served half of it. The other half, I cut into serving sizes, popped back into the freezer until my whipped cream was firm, and covered with plastic wrap. The next night, I pulled out a piece for myself when the kids had been tucked in for the night. The day after that, I shared a slice with a girlfriend who was here for tea. It’s the icebox pie that keeps on giving. Soften the cream cheese to room temperature, and the ice cream to squishy but not liquid. This way the cream cheese won’t seize up into tiny little beadlets in the ice cream. A food processor is my preferred method for crushing the Chocolate Cheerios because it yields a uniform crumb, but if you don’t have a food processor, you can definitely put the Cheerios into a zipper top bag and smash the business out of it with a rolling pin or heavy pan or rubber mallet. Aim for uniformity before mixing with your melted butter. I love the look of the 10 Minute Creamy Chocolate Icebox Pie when it is made in a 9-inch springform pan, but you can certainly do this in a deep-dish pie plate as easily. If you use the springform pan, line the bottom with a piece of parchment paper to make extraction easier and simply press the buttered Cheerios crumbs into an even layer over the bottom of the pan. If you opt for a pie plate, press them evenly across the bottom and about an inch up the sides of the pie plate. You can use a hand mixer or a stand mixer with a whisk attachment to whip the cream cheese first by itself and then with the ice cream. My preference is for the sheer power and speed of the stand mixer, but a hand mixer does the job admirably. 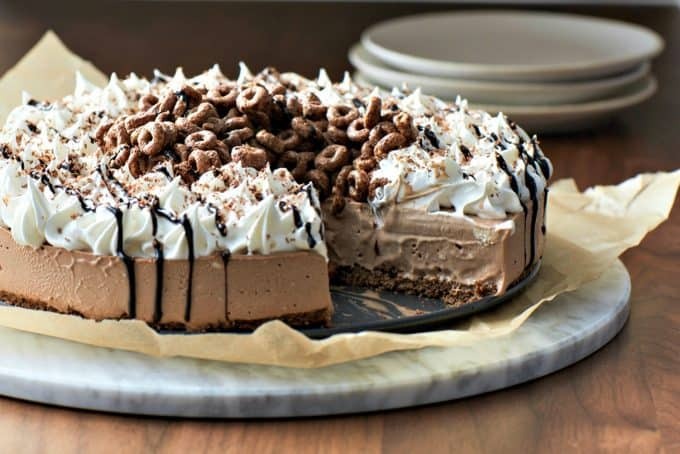 Allow the icebox pie to freeze thoroughly before adorning it with the whipped cream or Cool Whip, more Cheerios, chocolate syrup, and grated chocolate. Yes, I went there. Everybody has a preference, and I am giving you absolute permission to use whichever you prefer. When it comes to prettying up your icebox pie with whipped cream or whipped topping, you can either spread it on with a knife or use a piping bag to make it look like I have it here. Either way is fine and either way is delicious. When it comes to the chocolate syrup and chocolate for grating, use whichever you like best. I use whichever good dark chocolate I have on hand, because that’s what I love. For optimally creamy results, let your icebox pie stand at room temperature for 10 minutes before slicing and serving. Are you a big Icebox Pie fan? 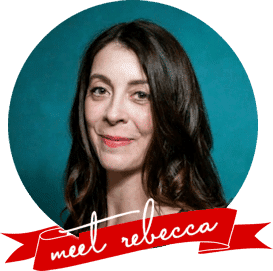 Try Joy’s Prizewinning Secret Ingredient Tropical Icebox Pie, Lemon Icebox Pie, Strawberry Ice Cream Cone Pie, Peanut Butter and Pretzel Icebox Cake, Boston Cream Pie Icebox Cake, and Strawberry Icebox Pie. 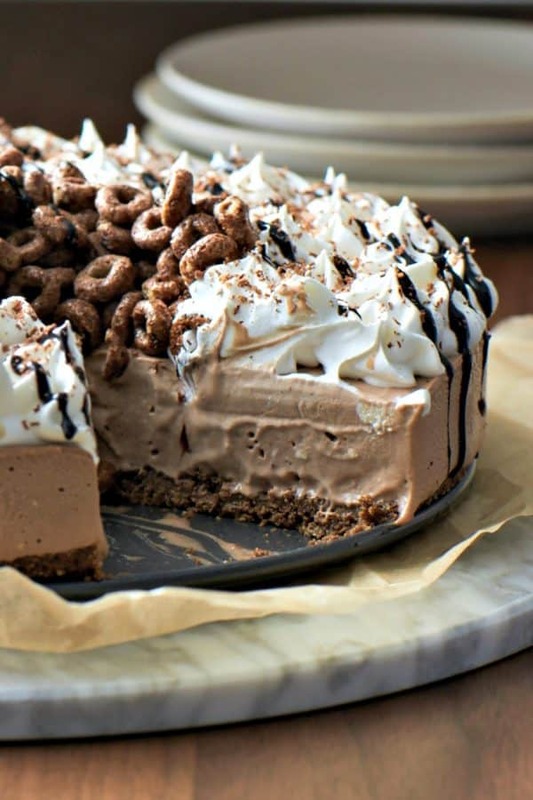 10 Minute Creamy Chocolate Icebox Pie is as impressive tasting as it is beautiful. Made from 7 simple, gluten-free ingredients, this is a crowd pleaser. Line a 9-inch springform pan with parchment paper or set out a deep dish pie plate. Crush 3 cups of the Cheerios into uniform, fine crumbs in a food processor or with a rolling pin in a zipper top bag. Toss the crumbs and butter together in the food processor or in your prepared pan. Press evenly over the bottom of the pan. Set aside. In a stand mixer fitted with a whisk attachment or a mixing bowl with a hand mixer, whip the cream cheese and vanilla extract together on HIGH until light and fluffy. Add in the squishy chocolate ice cream and whip until even, scraping down the sides of the bowl as needed. Transfer the filling to the prepared crust and spread evenly. Place in the freezer for at least 4 hours, or until frozen solid. After 4 hours, place a piece of plastic wrap directly on the surface if you do not plan on eating it that day. When you are ready to serve, let the icebox pie stand at room temperature for about 10 minutes before unmolding it if you used the springform pan. Pile up the remaining Chocolate Cheerios in the center of the icebox pie. Pipe or spread the whipped cream or whipped topping around the Cheerios, drizzle lightly with chocolate syrup, and grate some chocolate on a zester or fine cheese grater over the whole icebox pie. Slice and serve immediately. If you have leftovers, place back in the freezer uncovered until the whipped cream or whipped topping is firm, then cover with plastic wrap. This is not a sponsored post. I was happy be a guest of General Mills at their headquarters in Minneapolis, MN to learn about their fabulous whole grain cereal line-up and work with their crack team of food stylists and photographers, but all opinions, recipes, and photos remain my own. You combined my two favorite things, cereal and ice cream, into one dessert? I love you! This look amazing! What a fun recipe! I have a four year old friend who is going to lose her mind when I make this for her. Thanks for the inspiration. Aha! I watched the video (just read the blog post earlier) and saw that you do indeed lock the sides around the wrapped bottom. holy creamy, dreamy deliciousness!!!! pinning!! I love everything about this, and not just because I got a mention in the post. Seriously, though, what an awesome pie! Ice cream with a not overly sweet crust in a 10-minute pie? I’m in. TWICE. Holy cow that looks amazing! Pinning now. How genius are you to use chocolate cheerios!! 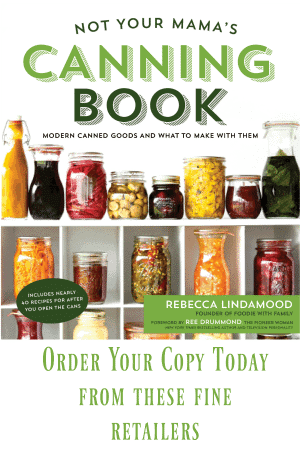 So happy you changed up sweet Rosemary’s idea into this! Fantastic! Love simple easy desserts. We made this Monday to eat on Pi Day. The boys, 7 and 12 pretty much made it themselves. We used mint chocolate chip ice cream and it was a huge hit! That is wonderful! I’m so glad!! Thank you! I love that you used a springform pan to make this! I love your recipes! But just a note about Cheerios and gluten- they are labeled “gluten free” but people who are sensitive to gluten are prone to react to Cheerios. They clearly are contaminated with gluten! My daughter and myself both had severe gluten reactions to them just this week and when I posted about it on my Facebook page many people responded they have had the same experience. So I would not recommend this recipe for people with a gluten sensitivity.